Happy Friday from a very chilly Atlanta! We are used to January temps in the 30's - low 50's, and it was 12 degrees this morning. That means good weather for coffee and blogging. My first favorite this week is Chat Patti. This is a little South Indian restaurant in Atlanta (near Target on North Druid Hills Road, a few blocks from I-85). You order at the counter, where you can see the food behind the counter (like a cafeteria) and also see photos of the food with names of dishes. There is no English menu, so this is a good place to go if you know South Indian food or if you are an adventurous diner! South Indian food is vegetarian, and does not include mushrooms, so I am happy with anything on the menu. I had basmati rice with chana masala (curried chickpeas) and an eggplant, okra, and potato masala (delicious but VERY spicy -- I had to order some yogurt to cut the spice). My friend and I split an order of samosas (fried potato appetizers - very yummy!). 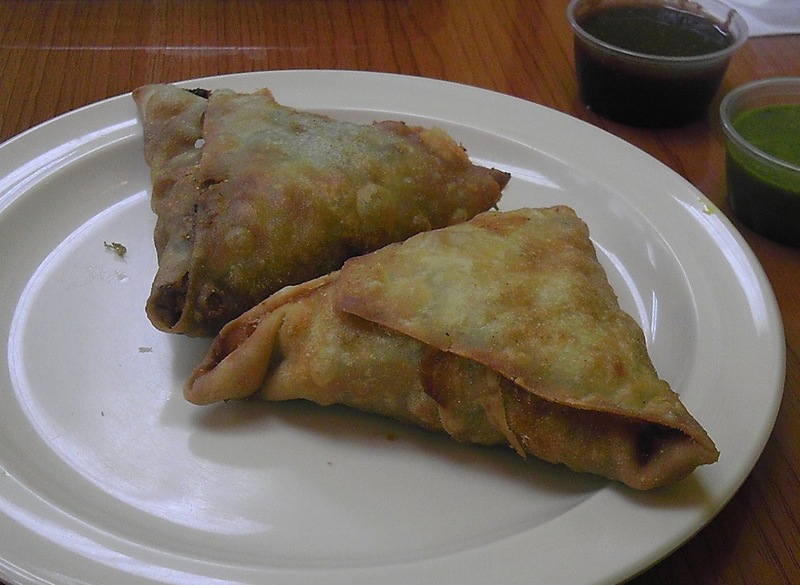 The samosas are served with chutney (sweet sauce) and green sauce (spicier). I have loved Indian food since college, and could easily eat it several times a week! My second favorite is New England Coffee. I live in the deep South and only discovered this old (since 1916) coffee company recently. I absolutely love every blend I have tried -- from San Francisco (bold and dark) to Breakfast Blend (light and smooth). I highly recommend this coffee! My third favorite is simple: flannel sheets. When it is 12 degrees on a cold night, flannel sheets are a wonderful invention. Dying for Indian. It feels like forever since I last had it. Come visit and we can go thrifting and eat Indian food. Hmmm, I live in Canada and consider flannel fleets part of the required bedding in the wintertime. Indian food sounds good right now. We're having company tonight and butter chicken was one potential menu idea. However, it lost out to a great big pot of comforting beef stew. A local brewery is going to be on the Dragon's Den on Wednesday and I wanted an excuse to try their craft beer though I suppose it would have gone with Indian food, too. Brenda, that sounds like a fun weekend! Hope you are having a great one!